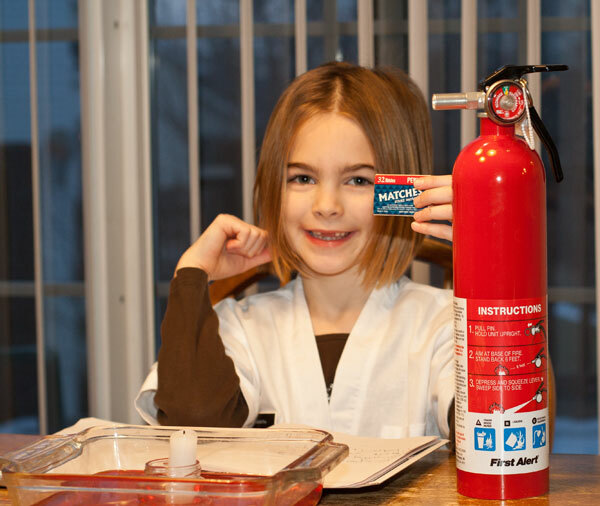 Sam the Science Kid Experiment #5: Fire! I also had a fire extinguisher handy, just in case. Sam seemed hopeful that it would be needed. Before we set fire to anything, though, I explained to Sam that fire needed two things to burn: fuel (like wood, gas, or a candle wick) and oxygen. The latter, I explained, was a gas comprising a good chunk of the air we breathe, along with nitrogen and a few other things. Nitrogen doesn’t do much in a fire, but oxygen, on the other hand, makes stuff burn REALLY good. So I lit the candle, propped it up in in the little jar, then put the jar in the dish of colored water as you can see in the photo above. I then held up the drinking glass and asked Sam what she thought would happen if I put the glass over the candle, creating an airtight seal because of the water. She paused a second. “The flame will go out!” she said. So, I asked Sam to write her prediction down in her journal. Experiment 5: Brning oxagen. I prdekt that it will drn 12 sikints. Than it will go owt. After she did this, I put the glass down, and after 16 seconds (according to my stopwatch) the fire dimmed and winked out. Sam was interested in seeing the fire go out for no apparent reason, but seemed happy that her prediction was correct, if off by a few seconds. She claimed that the air was all gone inside the glass, but I explained that there was still some gas in there, but that the oxygen was pretty much gone, having been used up in the fire. Almost immediately she pointed and said, “The water inside the glass is higher!” I agreed that it was and told her to think back about what she had learned about air pressure in Experiment 1 and Experiment 3. Almost immediately she said that the air pressure inside the glass must be lower, and the air outside the glass must be trying to get in there and pushing the red water down and up into the glass. At the risk of crooning about my kid, this struck me as a pretty damn insightful question, and I’m glad to see that she’s taking what she’s learning in these little experiments and trying to apply the facts to other phenomena in her world. 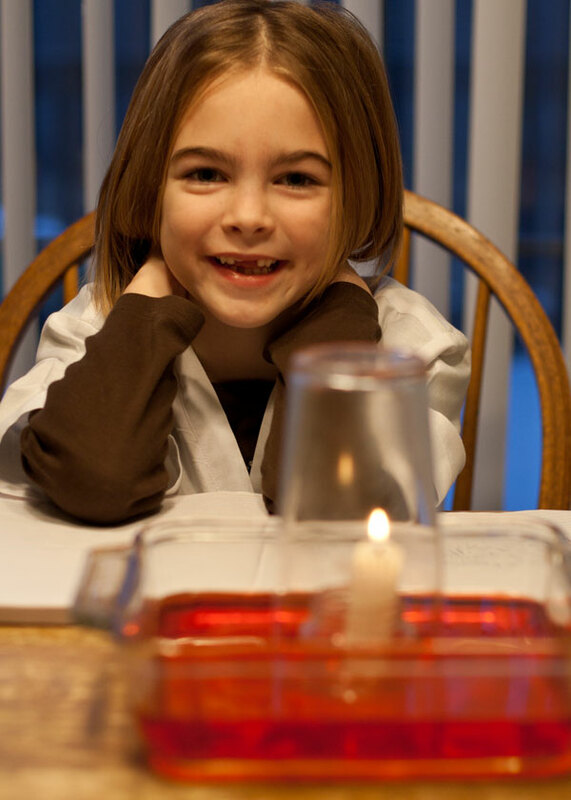 Unfortunately the best answer I could come up with to her question was that when we blow out candles we’re blowing the air past the flame so fast that it doesn’t have a chance to react with the oxygen. However, some subsequent web searching suggests that this answer is, in fact, wrong or at least incomplete. 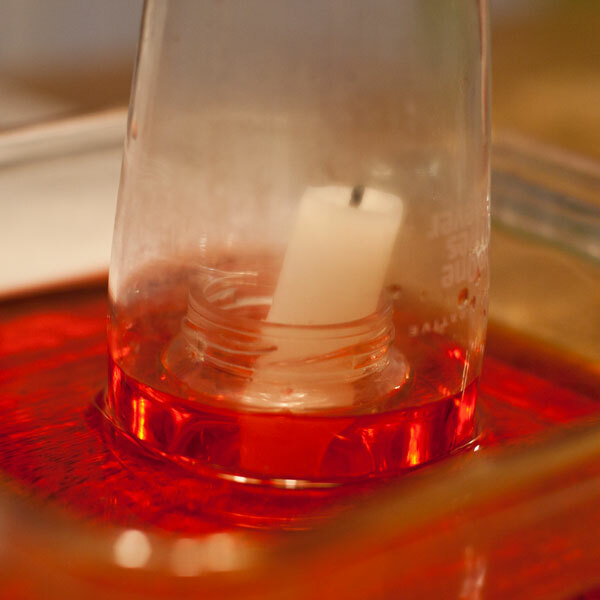 The real reason candles go out when you blow on them is that the fast air is actually lowering the temperature around the flame enough to stop the reaction and put it out –a temperature high enough for ignition being the third requirement for flame that I forgotten to mention. While I had to go back to Sam with this information and admit to not being as omniscient, it did give me a nice opportunity to explain the value of peer review to science. I think the laptop computer will be a standard piece of equipment to include with future experiments if for no other reason that we can take to the interwebs in the event of any more astute questions. Whoo hoo fire! Good thinking on her part about the birthday candles. Off to buy a fire extinguisher as I realize I don’t own one.